Noguchi Isao, now 65 years old, was born in the seed shop that his grandfather started in Hanno, in rural Saitama, northwest of Tokyo. Fascinated by the world of manga and animation since elementary school, he moved to Tokyo and dropped out of college to work for the famous animation company run by Tezuka Osamu. But when he turned 30, he quit Mushi Production Co. to enter his family’s seed business. In 2004, TV reporter/actor Watanabe Fumio contacted Noguchi’s seed shop, saying he wanted to eat “old” style vegetables with names like Hanshiro kyuri (a half-white cucumber that was popular in Tokyo in the Meiji era) and Izumi mizunasu (water eggplant from the Izumi area of Osaka which is particularly suitable for pickling). Of course, as the old sayings go, “Seeing is believing,” and “A picture is worth a thousand words.” In Japan, Noguchi explains, the saying is “Hyaku bun wa hitokuchi ni shikazu” or, loosely translated: “One bite is worth a hundred words.” He sees it as his mission to educate people about the great taste of “old” varieties of vegetables, and the importance of using local varieties that are well-suited to the climate, the geological features, and the soil. Since ancient times, farmers would carefully select seed from vegetables that grew well and tasted wonderful, in addition to other characteristics including shape and color. By saving such seed season after season, these native seeds (sometimes called heirloom varieties to emphasize their role as an important cultural heritage) became trusted as stable varieties over centuries. This is in stark contrast to the F1 seeds used for most vegetable farming since the 1960s, when they replaced the regular native varieties. F1 are hybrid seeds developed artificially so that the plants will grow fast and uniformly. The shape and size of the vegetables produced are also practically identical, for easy processing in the food industry and supermarkets. By contrast, heirloom seed produce often have uneven shapes and come in all sizes. Noguchi chuckles about a customer of an organic food delivery company who refused to accept a box of Miura daikon grown locally in Kanagawa prefecture, because none of the radishes in the box were the same size! It is thought that as many as 200 different kinds of daikon were grown in Japan during the Edo era (1603-1868). Today, most people think of daikon as a plain white vegetable, but there were many varieties with shades of purple or other colors and shapes. Noguchi emphasizes that taste is very different in heirloom varieties: “The F1 daikon is dull, there is no sweetness, while heirloom daikon really tastes like daikon!” Admittedly, the heirloom type can take up to four months to grow, while the F1 will be ready in just two months. But the heirloom daikon stays moist and tastes fresh longer. Noguchi’s grandfather won awards for his vegetables, including a Miyama turnip praised by experts almost 80 years ago, and still sold today as a heirloom seed. Recently, people who taste this Miyama turnip are surprised, telling Noguchi that they haven’t bothered eating turnip for a long time, because the F1 variety sold today simply doesn’t taste very good. 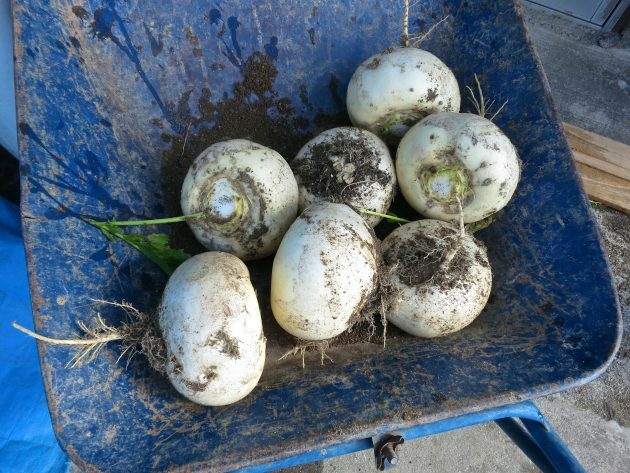 Turnips have been “improved” to the point where they have become unpalatable. Explaining why farming has changed so much, Noguchi mentions how nitrogen became available after WW2. Many factories had been built to maximize production of nitrogen for bombs. Using nitrogen as fertilizer was also a way to quickly produce more food, to alleviate postwar food shortages. Around the same time, the petrochemical industry developed and promoted more chemical fertilizers, pesticides, vinyl houses and other modern tools for farmers. Noguchi sees an irony in factories of war being so easily made to produce agrochemicals instead. By 1964, the year of the Tokyo Olympics, Japan had basically completed the shift towards “modern” agriculture. Around that time, it was getting more common to send second and third sons away to work in factories to earn a living. Reforms were introduced to help elderly farmers survive with only the help of one son. One such new system designated particular regions for specific vegetables or farm products so that new machines could be introduced to save labor. Designated vegetable production meant that a region like Kochi focused on red peppers, Gunma on cabbage, Kumamoto on tomatoes, and so on. But after a few years of continuous monoculture cropping, the soil suffered and insects became an increasing problem. The answer to this was more R&D into F1 varieties. This is how F1 vegetables became so common in Japan. Noguchi contrasts this situation with France, where some 70-80 percent of the vegetables come from heirloom seed, and even supermarkets mostly sell “old” style varieties. 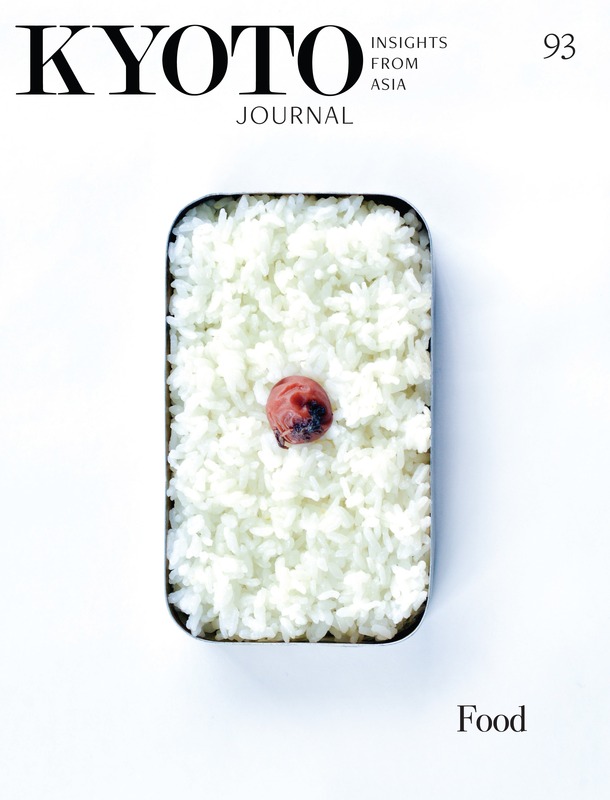 Noguchi is very critical of genetically modified organisms (GMO) and especially the development of GM foods. He thinks this is “environmental damage to the highest degree and worst extent possible.” In particular, he notes that the understanding of genetic engineering still is in its infancy, and the researchers do not really know what they are doing. “Neither insect resistance nor herbicide tolerance is very useful, except as a way for the agrochemicals industry to make a huge profit,” he says. He adds that they are profiting from the very problem they caused in the first place by encouraging farmers to use large amounts of agrochemicals, and now many plants and insects have become resistant and the toxic pesticides and herbicides have become useless. Noguchi warns that the so-called Terminator technology, an extreme form of genetic engineering that passes on a trait rendering the offspring of the GMO sterile, will make it impossible for farmers to save seed. “It is a suicide technology,” he says, pointing out that companies like Monsanto have already done a lot of R&D in this area. If this trait is accidentally spread across fields, for example through bacteria, it could be the origin of a terrible plague killing plants on our planet. He also reminds us that F1 hybrids work in a similar way, as the offspring do not breed true. Rather than entering such an abnormal world, Noguchi wants to promote healthy seeds. The regular native seeds (such as heirloom varieties) do not really need any chemical fertilizers, as the crops from such seeds are powerful enough to grow.